The apartment is in front of lake, recently renewed. The apartment is in front of lake, recently renewed. It is located in the middle of the city. It is face on Garibaldi square, the second most important square in the city. The apartment can host up to 4 persons: It has 1 bedroom with king size bed and 1 french sofa bed, a living room, a kitchen and a bathroom with a shower and a bathtube. It has Garage. There is pharmacy, newspaper kiosks, grocery, butcher's, bakery, pastries, ice-cream parlor, banks, restaurants / pizzerias, pubs, dresses and shoes shops. Tadini Palace (Academy of Fine Arts). The Cathedral of Santa Maria and the other historical churches, Square XIII Martyrs, The 3 Lovere's tower, the new Tourist Port (with amusements, shows and events), the swimming pools with the water park, the public gardens, the historic center (one of the most beautiful in Italy). The location is an ideal place to stay in a resort that is characterized by amusements, shopping and sports. On the lake (canoes, sailing boats, diving, boat trips, boat trips, 3 islands), in the ski resort of Montecampione, on the football pitch, basketball and volleyball. 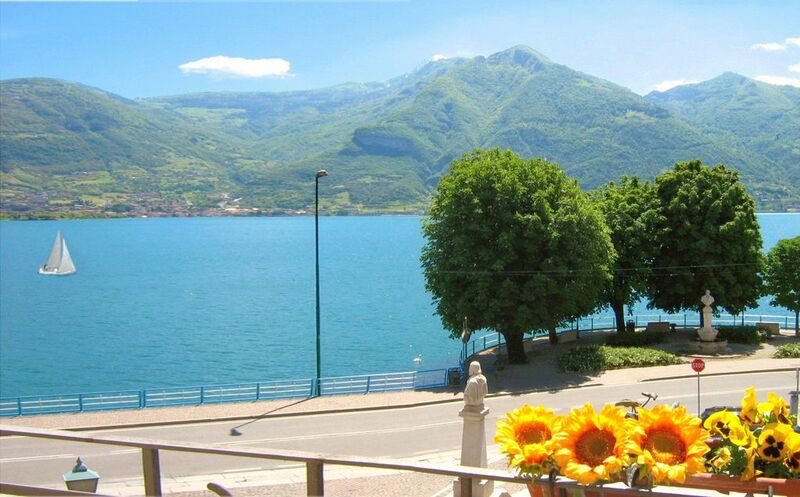 It is possible to turn by the complete bicycle Iseo Lake's perimeter. Extra Cost: Lovere Tourist Tax. from 1 April to 31October € 0. 50 per day for person for maximum 10 days staying. Childrens under 13 y. or. excluded. Payment in cash during the Check-out. Extra Cost: Lovere Tourist Tax. from 1 April to 31 October € 0.50 per day for person for maximum 10 days staying. Childrens under 13 y. or. excluded. Payment in cash during the Check-out. Great location and apartment had everything we needed. Nice south facing balcony. Although it was mid September the temperatures were in the high 20 s so we really appreciated the air-conditioning, which was surprisingly quiet. Lovely, small restaurant 2 minutes away call ART Restaurant & Pizza. Roberto was a perfect host and allowed us an earlier check-in and a later check-out. Lovere is a beautiful town. we are family with 2 kids 4 and 7 years old. We love Roberto's apartment because it is spacious enough for the family and located right at the lakeside at the small square with cafeteria gelateria and restorans few steps away. It is 5 min walk to the supermarket and open air swimming pool. We rented a car but did not use it much only to get from and to the airport. Roberto provided a space in underground garage. Our Ryanair flight was severely delayed and we arrived following morning but it was not a problem and Roberto allowed us to stay extra night at no additional cost. Overall great experience and great host, would stay again.